About "Area of equilateral triangle"
Here we are going to see how to find the area of triangle. We have shown the formulas used to be find the area of the triangle, examples to understand this topic. Here "a" represent the length of side of a triangle. This problem can be done in two ways. We have shown those two methods one by one. In the first method we have used the above formula to solve this problem. But in the second method we have used the formula (1/2) x b x h to find the area. 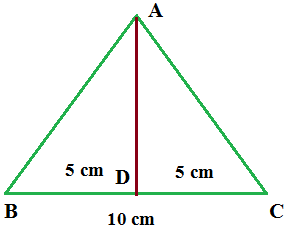 In the above triangle the measurement of the side DC is 5 cm. In the triangle ADC , the side AC is called hypotenuse side whose length is 10 cm. After having gone through the stuff given above, we hope that the students would have understood "Area of equilateral triangle"
Apart from the stuff given above, if you want to know more about "Area of a equilateral triangle", please click here.